My wife/ business partner and I shoot sporting clay's together and we compete in registered and non-registered shoots whenever we can. We love being around people while enjoying the outdoors and you can find us at least twice a month at Limestone Hunting Preserve and Sporting Clays practicing. The thing that we have learned over the years is hitting a moving target takes focus. Lots of shooters and instructors call this “Hard Target Focus”. When all you see is the target, your hands and gun move naturally to the position that enables you to hit the target. Retirement planning is a lot like this as your retirement goal is not static, it moves with the changes in your life, the market and the economy. It takes a tremendous amount of focus to hit that target as well. Having a plan and help in maintaining your “Hard Target Focus” will help you hit your retirement target. If you ever happen to be at Limestone, be sure and say hello. 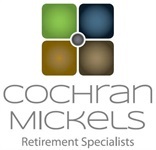 We would love to share with you what we have learned over the years shooting and retirement planning! Securities offered through Registered Representatives of Cambridge Investment Research, Inc., a broker-dealer, member FINRA/SIPC. Advisory services offered through Cambridge Investment Research Advisors, Inc, a Registered Investment Advisor. CochranMickels and Cambridge are not affiliated.